GIVEN | "Name On The Trophy"
who will be United’s next goalkeeper? The number one jersey at United has been one fraught with difficulties over the past forty years. For every Alex Stepney, there’s been a Jim Leighton, for every Peter Schmeichel a Massimo Taibi. In fact if you look a the list of ‘keepers that have played for United, just in Sir Alex Ferguson’s reign you’ll realise that it’s not always been the easiest position for the United manager to fill. Proven Premier League stars- Mark Bosnich, World Cup winners- Fabien Barthez, up and coming potentially world class stoppers- Tim Howard, and future England number ones –Ben Foster have all failed when it’s come to minding the space between the sticks at Old Trafford. Edwin Van Der Sar’s arrival at United, finally gave the fans and no doubt Fergie, the chance to breathe a huge sigh of relief. After all United fans had seen more than one or two duffers don the goalkeeping gloves for the Reds and there’d been a few horror stories along the way- Porto at home, Arsenal away, the 3-3 with Southampton,- you know what I’m talking about. Replacing VDS should not be underestimated, it’s one of the most difficult tasks Fergie will ever face as, as previous ‘keepers have shown, just because you’re good doesn’t mean you can handle the pressure at United. Many keepers who’ve struggled at United have gone on to be reliable, dare I say even world class stoppers somewhere else, just look at Tim Howard for example. With so much importance being, rightly, placed on VDS’s successor the rumour mill has been going into overdrive with stories of the nest ‘keeper ‘destined’ to be heading towards Old Trafford. The latest nugget suggests that Spain’s second choice and beach ball lover Pepe Reina could be a new target for Fergie to set his sights on. Roy Hodgson has already wubbished such claims insisting that his number one, who signed a new deal in April is going nowhere- especially to the arch rivals down the M62. So who is coming to United as the next number one? There’s been so many rumours it’s difficult to keep track so I’ve tried to narrow it down to five who could have the unenviable job of filling VDS’s gloves. 5. Pepe Reina. Liverpool. It’s a far-fetched rumour but it’s still doing the rounds so I’ll give it some credence, although not much. Could Reina really come to United? It’s highly unlikely, after all having signed a new contract only months ago, it would be up to Liverpool to sell him and that’s never going to happen. The recent takeover by ‘good’ American owners, means that the Anfield outfit will probably not have to sell any players to balance the books, least of all one of their best ones to United. 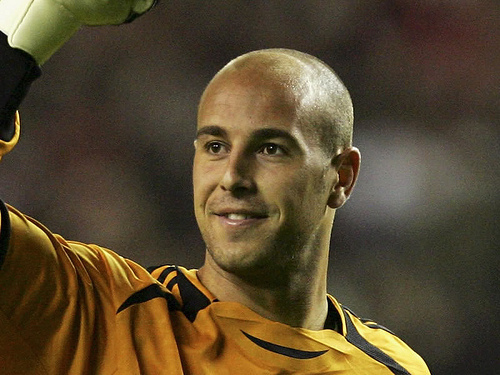 Could Reina do a job at Old Trafford? Probably. Although he is highly thought of and no doubt a very good stopper, he does like the occasional blunder and with any United keeper having large parts of the game where he’s not called upon, his concentration may be a slight worry. Personally, I’d prefer it if United went for someone a little but more reliable and a little less scouse-infected. 4. Shay Given. Manchester City. This may seem equally as far-fetched as the idea of Reina joining the Red and White Army, however there is a part of it that makes sense. Given is highly unlikely to want to stick around seeing the twilight of his career off by keeping Roque Santa Cruz warm on the City bench. He’s a proven world class keeper who has shown, not least in the 4-3 that he can produce stunning saves at the drop of a hat. The only problem to any such move would of course be City themselves who are about as likely to sell any player to United as they are to sign Wayne Rooney- but you never know. At 34, Given wouldn’t be a long-term signing but he could arguably do a job for at least two seasons if the unthinkable happened. 3. Igor Akinfeev. CSKA Moscow. Akinfeev is Russia’s international keeper and at only 24 years of age already has an impressive 34 caps. Fergie’s long meant to have been an admirer of the Russian and there’s little doubt that a significant bid could tempt CSKA to sell him. The only question mark would be could he handle the pressure of life at Old Trafford? That’s pretty impossible to tell unless he actually signed but there’s every reason to believe a player who’s stock is constantly rising could well be the man to take over from VDS. There’s been talk of Russian team mate and part time agony uncle- check out his blog it’s hilarious- Andrei Arshavin trying to convince him to go to the Emirates. Whether Arshavin is successful remains to be seen, but if Akinfeev did end up at Old Trafford, I for one wouldn’t be complaining. 2. Maarten Stekelenburg. Ajax. The Dutch stopper was one of the few players to emerge from the Holland team with his reputation enhanced following the world cup- despite their run to the final. Stekelenburg has taken over from VDS in the Dutch goal so replacing him for United may seem like a logical step- after all Ajax is also a former club of the United keeper. Standing around 6 foot 6 Stekelenburg is certainly one of the tallest keepers in world football but like VDS is pretty adept at getting down quick and as he proved in the World Cup final the big stage doesn’t faze him. If Edwin has a quiet word in his ear then Stekelenburg may well be Fergie’s big summer signing, he has already ruled out a move to Arsenal- who seem to be in the hunt for every goalkeeper who’s currently playing. 1. Anders Lindegaad. Aalesunds FK. Lindegaad has apparently caught Fergie’s eye recently after an impressive display for the Danish national side against Portugal. Although, he only played an hour, replacing the injured Thomas Sorensen, Lindegaad made some world class saves, including a stunning one to prevent Nani. United’s goalkeeping coach Eric Steele was despatched to Norway, where Lindegaad ply his trade obviously otherwise that would be just pointless, to give the keeper the once over and was apparently very impressed. With Fulham and Spurs supposedly in the hunt, it’s highly likely if Fergie does want him, he may have to move in the summer regardless of whether VDS is retiring or not. One advantage that Lindegaad may have over some of the others on this list is his relative small price- plus the fact that barely-known Danish keepers are pretty well thought of at Old Trafford.